'Carolina Wren', color pencil on paper, approx framed size 16" X 20". These little guys belt out the loudest, sassiest songs! Plus they're fearless and friendly, preferring to stay close to houses and people. 'Eastern Kingbird', color pencil and graphite on paper, framed approx 12" X 16". 'Black Throated Green Warbler', color pencil on board, framed approx 11" x 14"
framed approx 20" x 16"
approx size 20" X 16"
approx 16" X 20" framed. approx 18" X 16" framed. 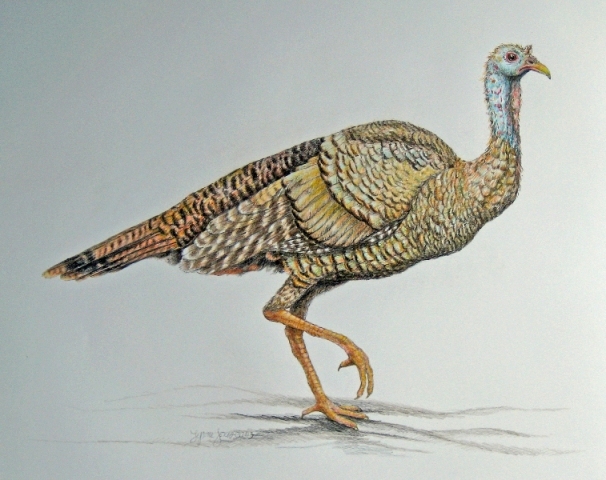 'Tom Turkey' and 'Hen Turkey', color pencil on paper, approx 18" X 22" framed.